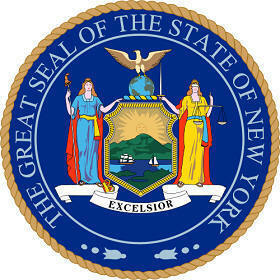 The New York state seal identifies government buildings and officials and is a centerpiece for the New York state flag. The symbolism, history and emblems of the New York seal are described in this article with fast facts and information. The American Bald Eagle is pictured at the top of the New York seal on a globe of the Earth, showing the north Atlantic Ocean with outlines of its shores. The globe is a symbol of worldliness & world travel. "By exhibiting the eastern and western continents on the globe, the old and new are brought together"
The figure of Lady Liberty is shown holding a staff topped with a gold liberty cap. The pileus, or Phrygian cap was said to be worn in ancient Rome by slaves who had won their freedom. A royal crown lies at her left foot, thrown down to represent overthrowing the British monarchy in the War of Independence (1775–1783). 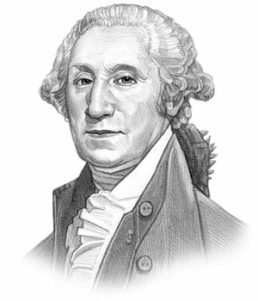 The New York State seal is kept and used as required by the Constitution and laws of the state. This is an early flyer that shows the 1876 design of the New York seal. The pictures either side of the centerpiece show an image of Niagara Falls and a picture of a paddle steamboat which was so important to early transportation in New York state.